Following the route to achieve a new level , "Haize" (wind) of the Basque Mountains award as activator, and at the same time, paying a visit to my sister who lives in Navarre, I've planned a new trip to that region. 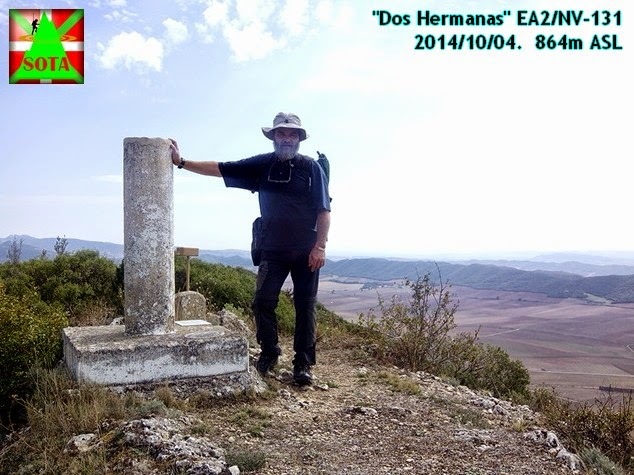 The summit, "Dos Hermanas" (two sisters) is very close to the village, although you must make some turns to hike it. There are two twin peaks of almost 900 m. ASL each. The weather was fine -perhaps a bit hotter than needed- and no wind at all. We reached the summit after 45 min hike, and started operating at 13:15 local time. We have planned to arrive to my sister's on time to dinner, so our time was short. But that was not our biggest problem. Just a few minutes after starting, a lot of winged ants came to us, invading almost all our holes: noses, ears, mouths,.. became full of ants quick. Oier started to shout asking for peace enough to eat his sandwitch. Without success. Antena, rig, backpacks, drinks and food were quick invaded by the small army. 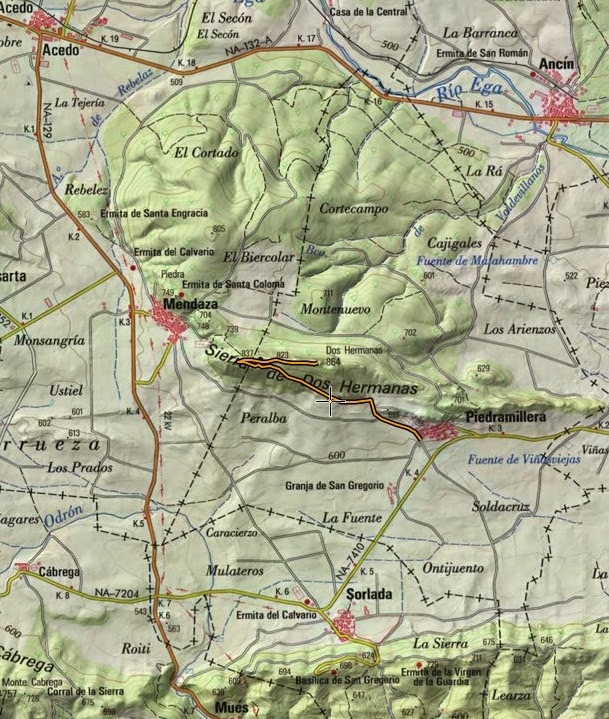 The sun also started to kick hard, and after paying a short visit to the other twin summit, where traces of a fortress of the XVIII century could be seen, we leaved the zone as quick as we could. Despite of the heavy fight against the flying ants, we were able to make 38 qsos, all of them on 14 Mhz (CW&SBB) with EU, AF, and NA, including 2 S2S. 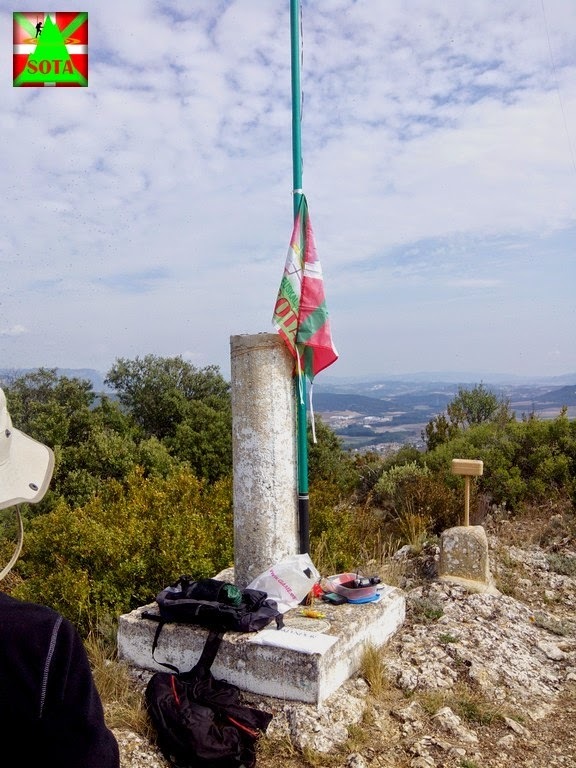 A short and problematic activation and, sadly, not good enough to allow us to work with the other EA2 stations that were activating some SOTA summits across Navarre. See you on the next summit!